Tom Ring climbed up on the billboard early Tuesday morning where he spent the next three days on this quest of raising money for the Miracle League of Northampton County. In the beginning his goal was to raise $25,000. 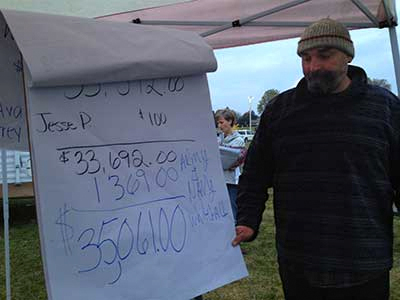 By late Thursday afternoon he had far surpassed that goal with a total of $35,061. Everyone – players, families, volunteers and the MLNC board members give a huge THANK YOU to Tom for spending his past three days and nights on the billboard so our players with physical and intellectual disabilities can play the game of baseball. From September 20, 1982 to June 7, 1983 three men sat on a billboard at Rt. 22 and Seventh St in Allentown trying to win an $18,000 Love modular home. This event is being recreated on a billboard located at the Chrin Community Center of Palmer Township where Tom Ring of Brown Daub KIA is sitting but not trying to win the home but more importantly to raise money for the Miracle League of Northampton County. He is also advertising a play which will take place at the State Theater on November 7th about the 1983 occupation of the Allentown billboard. We thank Tom for this special way of raising money for the kids.